​At the 15th annual United States Energy Association (USEA) State of the Energy Industry Forum, EEI President Tom Kuhn joined other energy association leaders to review the challenges and accomplishments of 2018 and look ahead to 2019's opportunities: "EEI's member companies are answering the challenges of transitioning to cleaner resources, reducing carbon emissions, modernizing the energy grid and building smarter energy infrastructure, and delivering innovative customer solutions in a rapidly changing world." Kuhn discussed the challenges of 2018, which included devastating wildfires, four nor'easters, and a pair of major hurricanes: "Mutual assistance is a hallmark of our industry—our companies have some of the most talented, caring, and dedicated workers anywhere," he said. "Beyond ensuring the safety of our customers and our workers, protecting the energy grid is our top priority. Our industry is working constantly to improve grid security, reliability, and resiliency, and we will continue to strengthen cyber and physical defenses and elevate preparedness." 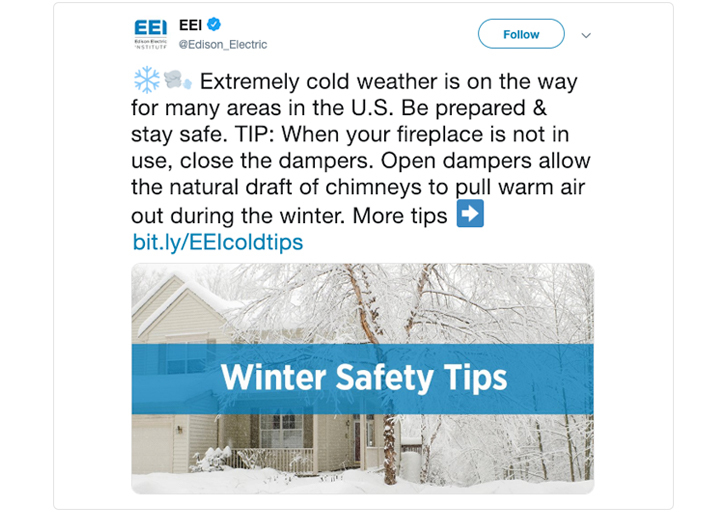 He also highlighted electric companies' commitments to reducing carbon dioxide emissions, to advancing electric transportation, and to keeping customers first: "Today, customers are informed about energy, and it matters to them where it comes from and how they use it. Saving money, using less energy, and protecting the environment are all important to them—and to us." $10.6 billion invested in environment and other categories. These investments benefit customers in many ways. For example, they include an estimated $60.3 billion in 2018 to enhance the energy grid and to further support grid security efforts. Since Superstorm Sandy, it is estimated that electric companies have invested more than $285 billion to harden the energy grid and make it more resilient. Electric companies’ investments are helping to make the energy grid even cleaner. Since 2005, the percentage of renewable sources in the energy mix has quadrupled, and more than half of the new electricity generation capacity is wind and solar. More than one-third of all U.S. electricity generation comes from carbon-free sources (nuclear energy, hydropower, and other renewables). Nuclear energy remains the largest source of emissions-free electricity, supplying more than 50 percent of America’s carbon-free electricity—and 20 percent of all electricity. Electric companies provide 69 percent of the solar energy in the country. Thanks to these investments in clean energy, the industry’s carbon dioxide emissions were 28 percent below 2005 levels—the lowest since 1988—as of year-end 2017. ​Preserve the reliability and affordability of electricity for all Americans, including low-income households. Foster a balanced energy mix to ensure electricity remains safe, reliable, and affordable. Expedite the process for permitting and siting energy infrastructure to ensure that energy can get where it is needed, when it is needed. Recognize the value that the energy grid provides and promote investment in new grid technologies. Ensure that everyone who uses the energy grid continues to share equitably in the costs of maintaining it. Help to strengthen the energy grid’s resilience against cyber and physical security attacks and natural disasters. Allow electric companies to plan, build, and operate the energy grid as a platform to integrate a diverse set of emerging technologies. Promote transportation electrification to enhance customer options and benefit the environment. Encourage the development of more robust battery technologies for both electric vehicles and energy storage. 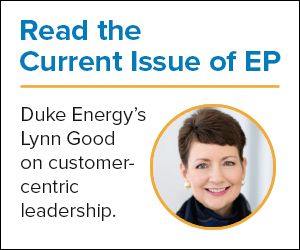 ​“In today’s market, customers want to feel engaged by companies—regardless of the kind of service they provide,” writes EEI Chairman Lynn Good, chairman, president, and CEO of Duke Energy, in Electric Perspectives. “They want personal, meaningful interactions when it comes to information and updates. What does that mean for an electric company as we shift more of our focus to the customer experience? Storms provide a good case study. “In a moment of crisis, customers want hyper-relevant and personalized information. They want to know how to get help, when that help is coming, and when their issue will be resolved. Today’s customers expect personalized information they can act on easily, such as up-to-the-minute usage data that allows them to monitor their energy spending. ​Each year, the Federal Reserve Board of Governors appoints the chairs and deputy chairs of the 12 Federal Reserve banks. For 2019, two leaders of electric companies have been renamed to key leadership roles at two of the banks. Anne R. Pramaggiore, senior executive vice president, Exelon Corporation and CEO, Exelon Utilities, has been renamed chair of the Federal Reserve Bank of Chicago. She has served on its board of directors since 2014, and has been chair since 2017. Mary Kipp, president and CEO of El Paso Electric Company, has been designated deputy chair of the Federal Reserve Bank of Dallas. She has served on the bank’s board since 2018, and, from 2016 to 2018, was a member of the bank’s El Paso branch. ​Duke Energy and Avista Development, an unregulated subsidiary of Avista Corporation, have announced a joint investment in Open Energy Solutions Inc. (OES) to develop open-source software for grid-edge technologies that will deliver benefits to customers, including information and tools to help them manage their energy usage. The companies say this is the first time that multiple electric companies have collaborated to create open-source software, spurring innovation and creating a new market for the technology. “This groundbreaking approach to meeting the needs of customers in the future will allow unrivaled creativity and thinking around energy management solutions, forever changing how technology interacts with energy grid systems, and ultimately paving the way for more control and information management for the customer of the future,” said Ed Schlect, chief strategy officer and vice president, Avista Corporation. This partnership builds upon the Duke Energy Emerging Technology Office’s exploration of open energy grid standards through the creation of the Open Field Message BusTM. “This platform will provide customers more options in how they interact with their energy company, while also delivering sustainable value and economic growth as we build a smarter energy future,” said Brian Savoy, Duke Energy’s senior vice president of business transformation and technology. The software will use interoperability concepts and distributed intelligence, allowing electric companies to integrate, coordinate, and optimize diverse assets—including the energy grid, traditional and renewable sources of electricity generation, customer assets, and more—with greater efficiency. OES plans to make the software available to users in an open-source format, and the Duke Energy-Avista investment in OES will help to expedite the creation of the first version of the software. 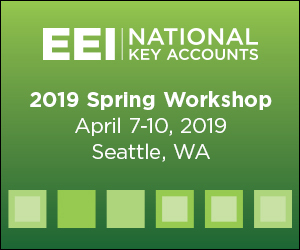 This work builds upon the industry’s progress in transforming the energy grid, and will help electric companies deliver more options to customers. “We see this as an opportunity to fill a gap the industry has previously been unable to fill with more traditional centralized software solutions,” said Wade Malcolm, CEO of OES. ​Across the country, electric companies are working to help students develop STEM skills and learn about the diverse, rewarding career opportunities open to them in the electric power industry. San Diego Gas and Electric (SDG&E) exemplifies this trend, as seen earlier this month when 10 San Diego-area high school girls graduated with an FAA Remote Pilot Certification after completing an intensive, 32-week program that included 130 hours of instruction to qualify them to build, program, and fly unmanned aircraft systems (UAS). To support their learning, SDG&E hosted a visit of the program’s participants to the company’s UAS training flight center so the students could see first-hand the technology's practical applications, including its use for energy infrastructure assessments. The host of the visit was Tashonda Taylor, SDG&E director of planning, design, construction, and vegetation management, and a member of the board of directors of the Elementary Institute of Science, a local nonprofit that led the program, known as Girls Take Flight. Taylor also is a participant in SDG&E’s #BeThatGirl program, through which the company’s professional women volunteer as role models and mentors for young girls, encouraging them to pursue studies and careers in engineering, meteorology, environmental science, computer science, biology and biotech, and many other STEM fields. EIS is one of more than one hundred beneficiaries of SDG&E's Inspiring Future Leaders giving initiative​, which aims to cultivate the next generation of diverse innovators and leaders in local communities by supporting K-12 STEM learning opportunities and workforce preparedness programs. These efforts are championed by the highest levels of SDG&E's executive leadership. Chief Operating Officer Caroline Winn heads up the #BeThatGirl initiative. Supporting diverse and underserved students through the Casa de Amistad program by pairing them with volunteer mentors who have STEM-based backgrounds to help drive academic achievement. ​The energy grid efficiently delivers safe and reliable energy so customers always have the power they need. Learn about how electric companies are making the energy grid smarter, cleaner, more dynamic, and more secure in EEI’s video​. ​“In electricity generation, natural gas and renewables have taken over where coal was king. Electrification is rapidly bringing us into the future—as we readily can see on our phones, in our homes, and in our cars,” writes Diane Leopold, president and CEO, Dominion Energy Gas Infrastructure Group, in the latest issue of Electric Perspectives. “Regulators and policymakers are driving aggressive goals to reduce carbon emissions at state and local levels. Customers are demanding more control and choice over their energy sources and usage.